When is the Best Time to Take a Nuclear Power Plant Offline? What happens to greenhouse gas emissions when a nuclear power plant goes offline? Let’s look at the Bruce Power complex in Kincardine, Ontario. On April 15, Bruce Power shut down the four reactors in its B building to enable a vacuum building outage (VBO). The vacuum building, which is an essential safety feature, needs regular maintenance that should last about a month. Shutting down Bruce B means some 3,268 MW of generating capacity needs to be replaced with some combination of hydro, gas and wind. Which combination is better for the environment? What about wind? Not as much help. Wind provides only four percent of Ontario’s electricity on average. Whether it could provide more would depend on whether the wind blows longer and stronger. Maybe it will, and maybe it won’t – hardly the reliability needed to replace the steady nuclear workhorse. And then there’s gas. It can be fired up quickly and easily, it runs reliably, and it doesn’t cost all that much more than nuclear power – about twice as much. In the best-case scenario, hydro would replace the power from the four Bruce B reactors. It’s the best case because hydro, like nuclear, generates no greenhouse gases. But there’s a problem. Hydro in Ontario is quite limited as a result of the province’s geography, and the province lacks sufficient transmission lines to import replacement power from Quebec. Also, even if the lines did exist, Quebec doesn’t have a spare hydro dam to match the output from the four reactors. The next-best scenario would use all the available hydro power, keeping cost and emissions down, and use gas for the rest. Very likely, hydro could replace half the nuclear energy from Bruce B, and natural gas would replace the other half. Is that a problem? After all, Ontario businesses and residents will still get steady, reliable electricity – just as they did with the Bruce reactors. But here’s the thing – natural gas emits greenhouse gases, especially carbon dioxide, which is primarily responsible for climate change. Replacing half the nuclear output with gas means the province’s gas plants will emit an additional 295,095 tonnes of carbon dioxide. For perspective, that’s the weight equivalent of about 300,000 adult giraffes. What else would produce 295,095 tonnes of CO2? And that’s not all. Unlike nuclear and hydro, gas also emits nitrogen oxides (NOx), sulphur oxides (SOx), and particulate matter (PM) during operation. These “other” greenhouse gases cause lung and heart disease, and make these conditions worse. They can also harm plants and animals on land and in the sea. And they can even cause building materials to deteriorate and weaken. Of course, if hydro weren’t able to stand in for the offline nuclear plants, then Ontario would need to use gas alone. And that would mean the weight of another 300,000 giraffes in greenhouse gas emissions, or another 35,563 trips around the world (“Are we there yet?”), or another 82,394 round trips to Sydney. So, timing is everything. Scheduling the VBO in spring, when hydro reaches its peak performance, was a wise decision. Just how much hydro will be available, and how much gas is actually used, remains to be seen. You can track the results on the CNA website, if you like. Check our emissions tracking. Tags Bruce Power, CO2, GHG emissions, hydro, natural gas, Nuclear Energy, nuclear power plant, Ontario, vacuum building outage, VBO, wind | Permalink | Comments Off on When is the Best Time to Take a Nuclear Power Plant Offline? Curious how much nuclear power is being generated in Ontario on any given day? What about any given hour? If so, you may want to check out the CNA’s new ‘Energy in Ontario’ web app, which shows daily and hourly energy generation by selected fuels – and related lifecycle pollution emissions. You can see how much power was generated from nuclear, gas and wind, as well as how many tons of carbon dioxide (CO2), and kilograms of particulate matter (PM), oxides of nitrogen (NOx), and oxides of sulfur (SOx) each source emitted. A nifty feature also shows you what the environmental impact would have been had a combination of wind and gas replaced the power that nuclear generated. On average, carbon emissions would have been five to eight times higher than what they actually were. What’s important to note about the CNA’s emission data, and is different from some of the other data out there, is that we’ve considered lifecycle factors, such as construction, transportation, operation and decommissioning. This is why nuclear, for example, appears to be generating emissions on a regular basis. We’re working on adding all of Ontario’s current fuel types, including hydro, solar, and biofuel, as well as distinguishing between simple and rankine cycle gas. We’re also developing a historical overview, showing yearly energy output and emissions, by fuel type, dating back to 2008. All of this information is important in trying to show the effect that nuclear power has in curbing air pollution in Ontario. If not for the significant ramp-up in nuclear output, the province would be facing much more serious health and environmental problems. Check out the live data on the CNA website, under ‘Resources,’ or click here. Is renewable energy necessarily green? Only if it can generate electricity without adding more carbon to the atmosphere. Power utilities across Canada and around the world are ramping up their renewable energy sources, and adding wind to their supply mixes because it seems so clean, so green. But a recent independent study of life-cycle carbon emissions questions whether wind power really reduces greenhouse gases in real-world uses. 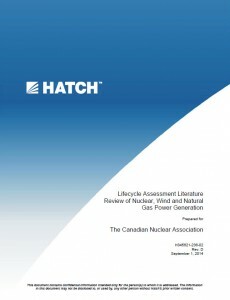 The study, by the Toronto-based engineering firm Hatch Ltd., compared greenhouse gas (GHG) emissions from nuclear power plants and from wind farms backed by natural gas plants. It’s an apples-to-apples comparison: Nuclear plants generate around the clock, but wind plants operate only when the wind blows. To match a nuclear plant’s output, a wind farm needs backup. The replacement power usually comes from hydro dams, which can open additional gates to raise electrical output, or from natural gas plants that fire up additional burners. Gas plants are faster and easier to build than hydro dams, so they often supplement wind farms. Looking at actual generation data, the Hatch team estimated that wind farms produce only 20 percent of their potential, and assumed that natural gas plants would make up the difference. The analysis estimated nuclear power emitted 18.5 grams of greenhouse gases per kilowatt-hour (kWh) through the entire life cycle, compared to 385 grams per kWh for wind backed by natural gas. In other words, a decision to invest in wind plants is actually a decision to produce climate-changing greenhouse gases. “When considering wind backed by natural gas power (20%/80%) to compensate for intermittency, emissions from the modified grid mix closely resemble that of natural gas production, diluted by a low-emissions power source,” the study noted. To the average person, the term “renewable energy” suggests an energy source that does not contribute to climate change. But “renewable” doesn’t always mean “low-carbon.” A closer examination, such as the Hatch study, shows that nuclear energy is the better choice for the climate. The Thousand Islands Energy Research Forum took place at the University of Ottawa this past weekend. CNA took advantage of this great opportunity to present the recent Hatch life cycle emission study, which had been launched on October 8 at our Toronto fall seminar. TIERF, an annual academic event that mixes energy policy and technology, drew about 40 university, government and industry participants this year. They brought presentations and technical posters on energy technology research, ranging from shale gas to geothermal to nuclear. CNA director of research and policy John Stewart delivered a summary of the Hatch study along with CNA’s key messages from it. While nuclear is roughly as clean-emitting as wind for power generation, wind cannot stand alone due to its intermittency, and any assessment of wind’s environmental effects must include the impact of managing that intermittency. In Ontario today, new wind farms are only generating about 20% of their capacity, and when the wind fails to blow, the difference is generally made up by burning natural gas, a fossil fuel. This means that building new wind capacity means building in more, not less, GHG emissions to Ontario’s supply mix – undoing some of the benefits of the province’s successful exit from coal. CNA’s presentation on October 25 was preceded by an excellent analysis by u of O’s Olayinka Willliams on “The Integration of Wind Power Generation with Hydroelectricity in an Electric Grid,” which expounded the many problems of bringing randomly intermittent wind power into a grid, even when hydro is available to back it up. According to the Electric Power Research Institute, “the existing electric power grid, especially its distribution systems, was not designed to accommodate a high penetration of distributed energy resources while sustaining high levels of electric quality and reliability.” (“The Integrated Grid,” February 2014). Bollen and Hassan’s 2011 engineering text Integration of Distributed Generation in the Power System says the problems include increased risk of overload and increased losses; increased risk of overvoltages; increased levels of power-quality disturbances; and impacts on power-system stability and operation.